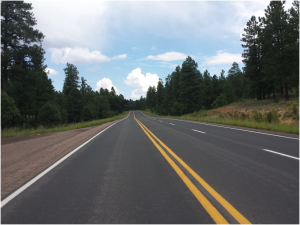 One of the most versatile tools in the road maintenance arsenal, Microsurfacing is a polymer modified cold-mix paving system that can remedy a broad range of problems on today’s streets, highways and airfields. 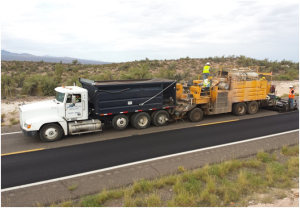 Microsurfacing begins as a mixture of dense-graded aggregate, asphalt, emulsion, water, and mineral fillers with advance polymers and other modern additives. The mixture is made and applied to existing pavements by a specialized machine which carries all components, mixes them on the site, and spreads the mixture onto the road surface. Materials are continuously and accurately measured and then thoroughly combined in the machine’s mixer. 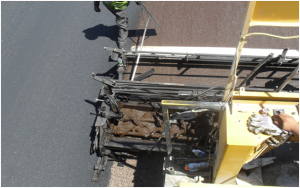 As the machine moves forward, the mixture is continuously fed into a full-width surfacing box which spreads the mixture across the width of the traffic lane in a single pass. Edges of the microsurfacing are automatically feathered. The new surface is a dark brown color and changes to a finished black surface as the water is chemically ejected and the surface cures. Traffic is permitted within one hour in most cases. Continuous-load machines utilize support units which bring the materials to the job site and load the machine while it is working thus maximizing production and minimizing transverse joints.